Animal rights activists have accused the London-based Harry Potter studio tour of subjecting live owls, used as “animal entertainers,” to cruel and demeaning conditions. The animal rights group published a YouTube video, which it claims shows owls being mistreated by trainers and staff at the Harry Potter themed studio tour in the UK. PETA have called on Warner Bros. Studio Tour to stop exploiting animals for entertainment. The studio said it was investigating the claims. An undercover video shows owls suspended in small cages, sometimes being made to perform “demeaning” tricks, as tourists take photographs of them. 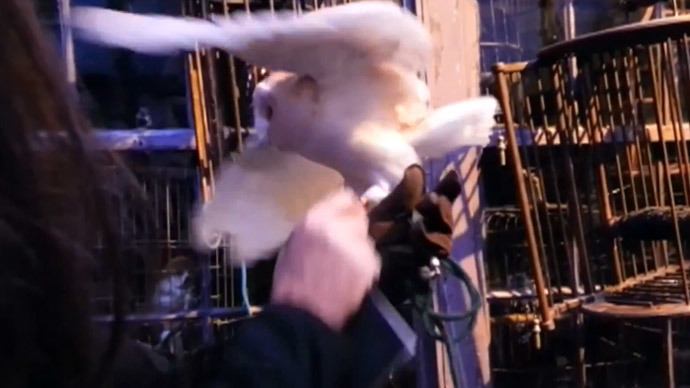 PETA claims the owls are “clearly distressed,” as the birds are blinded by flash photography. The video also shows a trainer encouraging visitors to stroke the birds, despite signs instructing people not to touch them. PETA says owls find this “stressful” and it also interferes with the oils in their feathers which keep them warm. At one point a trainer suggests visitors purchase their own owls. “You can buy them … The bird has to have a license, [but] you do not have to,” he says. PETA sent a letter to Warner Bros. Studio Tour calling on the firm to ban the use of live animals on tours. “PETA are calling on Warner Bros. Studio Tour London to make sure that the Harry Potter tour stays magical – and not cruel – by keeping live animals out of it,” she said. Warner Bros. Studio Tour distanced itself from the allegations in a statement, stating the birds are taken care of by an outside company. “The owls that appeared in the Harry Potter film series occasionally come to the studio tour. A spokeswoman for Birds and Animals told the BBC: “The welfare of our birds and animals is our number one priority and we want to ensure they remain stress-free and healthy. “The owls are always given regular breaks and closely monitored by a vet. Now that we have had the opportunity to see the footage, we have instigated a review of the issues raised. According to the Hollywood Reporter, Bird and Animals have now begun a review of PETA’s allegations. PETA claims the “inexcusable mistreatment” of owls is against the spirit of Harry Potter. The Harry Potter Studio Tour opened in 2012 and employs more than 300 people. It is located where all eight Harry Potter movies were filmed. It features sets, costumes and props from the series.